Seaside Florida is on the Gulf of Mexico about halfway between Panama City and Fort Walton Beach in the Florida Panhandle. There are commercial flights into Pensacola, Panama City, Tallahassee and Fort Walton Beach. It is a 45 to 90 minute drive from these airports to Seaside. The new airport near Panama City is named Beaches International Airport. Guess what the local politicians think is the attraction that draws tourists to Northwest Florida? A gentleman named Robert Davis decided to turn his family's 80 acres near Seagrove Beach into a brand new model for all Florida Towns. His grandfather had bought the property in the 1940's, and it was a family retreat. The Florida towns of old were places where folks sat on their front porches and chatted with neighbors walking by. People could walk to the post office, the library or the grocery store. Mr. Davis wanted to create this kind of town using Florida cracker architecture. This features small wood frame houses with big porches. 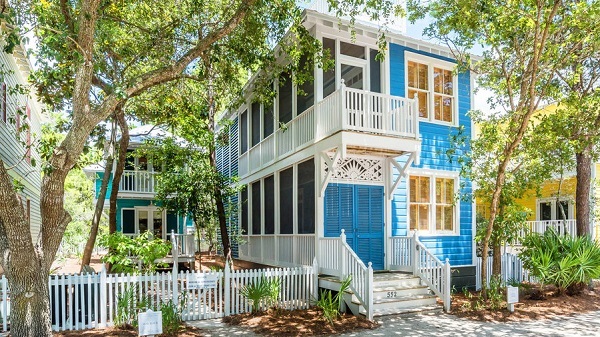 In an oceanside community like Seaside Florida, the houses have windows that actually open and provide good cross ventilation for enjoyment of the sea breezes. Wide roof overhangs provide shade from the Florida sun and protection from the torrential summer rains. Mr. Davis created the ideal community with the help of Miami architects Andres Duany and Elizabeth Plater-Zyberk. Other architects, including Melanie Taylor and Robert Orr, designed most of the buildings in Seaside Florida. This talented team and enlightened owner created a small town from scratch, with pedestrian friendly streets and town squares. Although they probably didn't intend it, the town has also become one of the most popular Florida tourist attractions because of its unique character. Seaside Florida started to come out of the ground in 1981. We Floridians think of it as a new town, but it is already more than 30 years old. 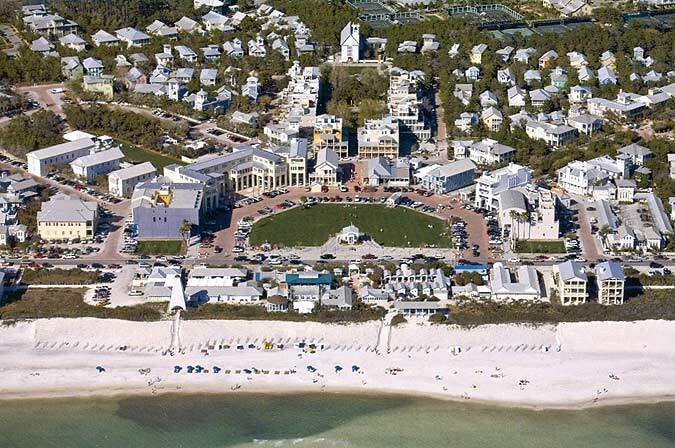 The concept used in creating Seaside Florida has been dubbed "New Urbanism". It was the first of it's kind in Florida, but it has inspired a host of worthy imitators, including several in the same Gulf coast neighborhood. New Urbanism is a design concept that emphasizes walkable neighborhoods and a wide range of residential and commercial uses. It reaches back for its inspiration to the era before automobiles were so common. Since Seaside was born, it is estimated that more than 600 communities have been created in the United States using the principles of New Urbanism. Most of the residents of Seaside are seasonal. It is a town of vacation homes, but it has a good community feel about it anyway. A visit to Seaside is a bit like a visit to Disney's Celebration. You feel like you are in a perfect town with wholesome people. No wonder Seaside was chosen as the location for the filming of the Jim Carrey movie, The Truman Show. Truman Burbank is the unwitting star of a reality television show. He lives a perfect life in a perfect town. Seaside is probably more in harmony with Walt Disney's vision for Epcot than what his successors at Disney finally created at Celebration. After seeing the success of Seaside, the Disney organization created Celebration near its Orlando attractions. 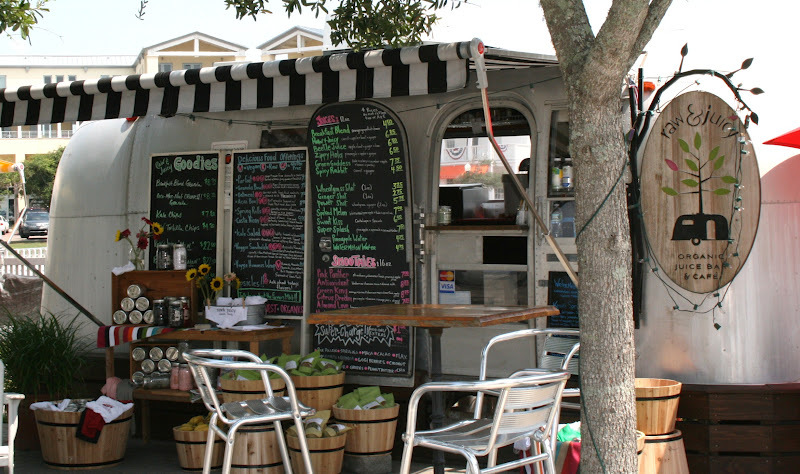 Seaside, Florida is a wonderful place to visit. There are vacation rentals galore, a beautiful white sand beach, and plenty of restaurants, quaint beachy sandwich and coffee shops and bars open to the sea breezes. Lots that originally sold for $ 15,000 in 1981 have resold for more than $1 million. Nearby Grayton Beach State Park has nature trails, kayaking areas, camping cabins and tent camping areas. It also has a wonderful white sand beach. Topsail Hill Preserve State Park also has a spectacular beach and high sand dunes. There are only a few lodging establishments in Seaside, but there are plenty of hotels and motels in nearby towns. There are also other forms of lodging including Florida state parks and private campgrounds. Hibiscus Coffee & Guesthouse, 85 DeFuniak St, Grayton Beach, FL 32459. Tel: 850-231-2733. This inn focuses on vegetarian fare, and is close to Seaside. Surrounded by trees, flowers and herb gardens,it is close to the beach. Eleven guest rooms with private baths, reasonable rates. Inn By The Sea, 38 Seaside Avenue, Seaside-FL 32459. Tel: 850-231-2334. This is a classic little bed and breakfast designed by Vera Bradley. It is in the heart of Seaside, and offers full privileges to the private swimming, tennis and fitness club at Seaside. It has 9 comfortable well appointed rooms. Rooms from $380 to $605 a night depending on the season. 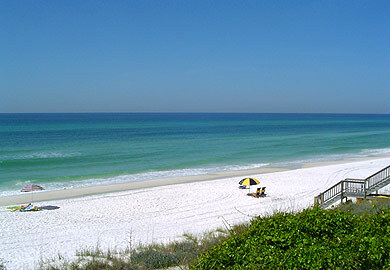 Sugar Beach Inn, 3501 East Scenic 30-A, Seagrove Beach, FL 32459. Tel: 850-231-1577. Only one mile from Seaside, this is an attractive Victorian home located just steps from the sugar white sand of the Gulf. Five guest rooms with queen size beds, full baths and cable television. Clean, friendly, reasonably priced. Bud and Alley's is one of the most popular places on this stretch of the Gulf coast. It has been around since 1986, and is located at at 2236 E. Scenic 30-A in Seaside. Call for reservations or just drop in. It is one of the best places in Florida to watch the sunset. Phone 850-231-5900. By car, take US-98 out of Panama City and go west about 30 miles to SR-395. Go south two miles to SR-30A, turn west (right) and you will find Seaside about a mile down the road. 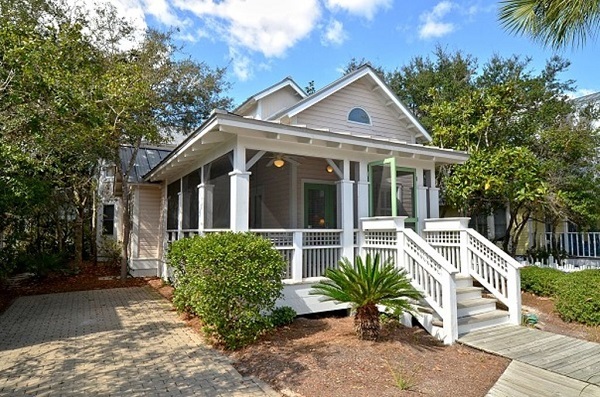 Seaside sits comfortably between the older communities of Seagrove Beach and Grayton Beach.